Product prices and availability are accurate as of 2019-04-05 06:28:52 EDT and are subject to change. Any price and availability information displayed on http://www.amazon.com/ at the time of purchase will apply to the purchase of this product. Sage 50 Pro Accounting 2015 delivers the efficiency your business requires whether youre after rapid expansion steady growth or maintaining stability. This comprehensive solution lets you easily manage customer contacts and sales customize inventory and vendor management automate purchasing and shipping track jobs and projects and more.Keep Your Business on Track With ConfidenceOrganize your finances and get more done every day with Sage 50 Pro Accounting. Its time to feel confident about your money and move your business forward. 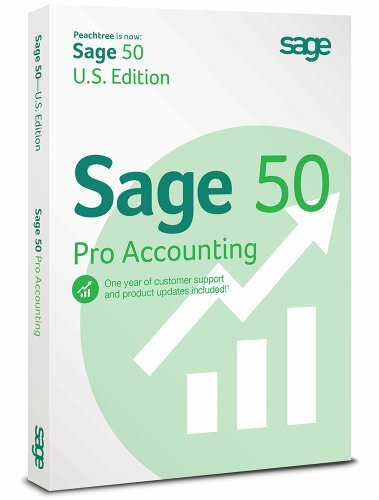 For that extra boost in confidence Sage 50 comes fully supported and includes valuable tools and services that help you save time and money.With Sage 50 Pro Accounting you can - . Organize your finances.. Pay bills and get paid.. Control cash flow and costs.. Manage inventory employees and customers.. Easily pay bills and get paid.. Get smart about managing cash flow.. Sage 50 Payroll Solutions.System Requirements - . Operating System - Windows 8 Windows 7 Windows Vista SP1.. Processor - 2.0 GHz minimum 2.4 GHz recommended.. RAM - 1 GB 2GB Recommended for multi-user.. Hard Drive Space - 1GB.. Browser - IE 7 or higher.. Other - Internet connection.NET Framework 4.0.